BEIJING, May 15 (Xinhua) -- Chinese Premier Wen Jiabao has ordered the armed forces and civil aviation department to deploy 90 more helicopters for rescue missions in quake-hit Sichuan province. The decision was made at a late Wednesday evening meeting of the national quake relief headquarters held on a running train from Sichuan provincial capital Chengdu to Guangyuan city about 200 kilometers away. China's air force will deploy 60 more helicopters and the other 30 will be provided by the civil aviation industry, according to the headquarters headed by Wen himself. An earthquake, measuring 7.8 on the Richter scale, struck Wenchuan County of southwestern Sichuan Province Monday afternoon, killing almost 15,000 people nationwide. Since the rescue missions started on Monday, 20 helicopters have been dispatched to quake-hit areas for reconnaissance, food and water airdropping, transporting injured people and delivering rescuers. Premier Wen urged in the meeting that saving people's lives was still the top priority of the disaster relief work more than 50 hours after the quake. "We must use all our forces, and save lives at whatever costs. Life is the most precious thing, we must be amenable to the people and the history," Wen said. Forty-four counties and districts in Sichuan were severely affected by the quake. About half of the 20 million population in these areas were directly affected by the quake, according to the meeting. Since most of the quake-hit areas are mountainous villages, thousands of rescuers and hundreds of tons of materials were held up on the ways, blocked by rocks and mud shaken down from roadside, to the quake's epicenter, making air support a vital need. China's air force, army aviation and civil aviation have made ever largest noncombat air operation since Monday, mobilizing more than 150 airplanes in various relief missions. The air force has deployed more than 40 transporters which delivered about 8,600 rescuers and 200 tons of materials with more than 130 flights in 48 hours after quake. The force also parachuted 15 elite airborne troopers to a county close to the epicenter who jumped out of plane at about 4,900 meter above sea level and landed without ground instruction and weather reference on Wednesday afternoon. As of mid-Wednesday, rescuers have reached all the affected counties and began rescue efforts there. The meeting decided to mobilize 30,000 more troops for the relief efforts, raising the total number of PLA and armed police soldiers involved in the rescue operation to 100,000. More than 16,000 policemen are already involved in the rescue efforts. 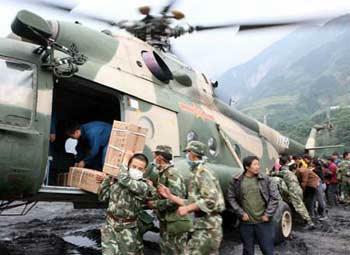 Throughout Wednesday, 18,277 injured people were rescued in Sichuan, increasing the total number to 64,725. Among them are 1,620 people seriously injured, according to information from the meeting.